The data contained in our two-part report series, A Growing Population: The Surge of Women into Texas’ Criminal Justice System and An Unsupported Population: The Treatment of Women in Texas’ Criminal Justice System, shines a light on an otherwise understudied and underserved population. As agencies and service providers capture more comprehensive data about justice system-impacted women, we will be better able to examine the practices and policies that drive women into the criminal justice system so as to more effectively stem and reverse the number of women under correctional control. We will continue to lift the voices of incarcerated women in advocating for better conditions that afford women dignity, help them stay connected to their families, and support them to be successful in their communities. 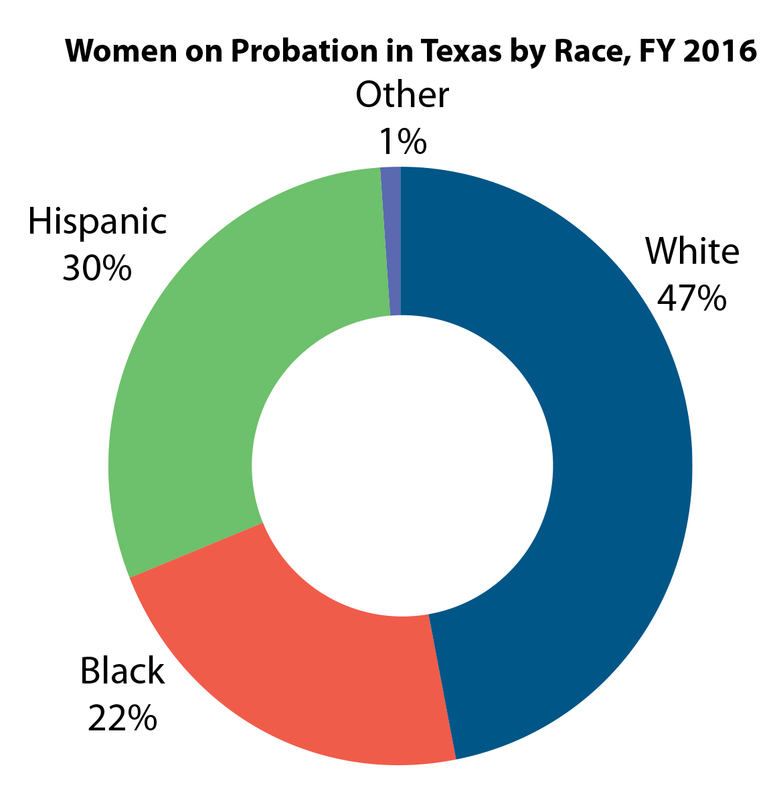 Below, we have provided data on women on probation, in jail, in prison, and on parole in Texas. Of all women under control of the U.S. correctional system, 75% are on probation. The same percentage holds true for Texas. Of the 89,045 women under state supervision in FY 2016 – including those who are incarcerated, on probation, and on parole – women on probation totaled 75%, or 67,046 women. As you can see in the chart below, most women placed on probation are white. Women on probation are largely between the ages of 26 and 50. While similar percentages of men and women are on probation for a controlled substance offense, men are otherwise more likely than women to be on probation for a violent offense, while women are most likely to be on probation for a property offense. Approximately 18% of women on probation in FY 2016 were served through a special needs caseload. These caseloads target high-need/high-risk felony probationers based on a validated risk assessment and supervision plan. The most prevalent specialized caseloads for women were substance abuse (6,079 women served), mental health (2,900), and high-risk (1,018) specialized caseloads. Probationers may also be on one or more non-caseload programs. The most prevalent non-caseload programs for women were outpatient substance abuse treatment and pretrial services. The revocation rate for women on probation in FY 2016 was 17% (11,469 probationers), pointing to the need for more effective assistance to help them succeed in the community. TDCJ does not track the number of probationers who have dependent children. Nearly half the women behind bars in America are held in jail, rather than in state or federal prisons, compared to one-third of all incarcerated men being held in jail. More specifically, approximately 99,000 women are incarcerated in state prisons while 96,000 women are confined in local jails. Of women in jails across the country, 60% have not been convicted of a crime – they are awaiting trial. In Texas, the number of women in jails awaiting trial – totaling around 6,300 – has grown 48% since 2011, compared to an increase of 11% for men over that time period. However, the number of female arrests in Texas has decreased 20% since 2011, suggesting the growth of women in Texas jails is not the result of rising crime. Many bail systems do not take into account a person’s indigency and, as such, they force people who otherwise pose no threat to the public to remain incarcerated until trial; riskier but wealthier defendants can buy their way out of jail and will have limited oversight. Such resource-based bail systems are particularly problematic for women, as poverty is a particularly significant factor for justice system-involved women. A higher percentage of women reported incomes of less than $600 per month immediately prior to their incarceration than their male counterparts, with two-thirds of these women earning minimum wage in entry-level positions. The earning potential of this population is additionally stifled by low education levels, as 44% of incarcerated women across the U.S. have not graduated from high school or obtained a GED. For Black and Hispanic women, struggles relating to poverty are even more likely because they face the greatest wealth disadvantage. According to a national study, around half of all single Black and Hispanic women have a zero or negative net worth, and the average household median wealth for all single Black women was $100, compared to $41,500 for single white women. The combined result of this wealth disparity and Texas’ money-based bail system is that women like Sandra Bland – women with needs that should be addressed in other settings – are sitting in Texas jails, not because they are a threat to public safety, but because they simply cannot afford to post bail. As stated in the Houston Chronicle shortly after Ms. Bland’s tragic death, she would probably still be alive today if the bail system was fair. Another concerning population of women held in jail are those who are pregnant. An average 367 pregnant females were booked into Texas county jails each month in 2017. Further analysis of women in Texas jails is limited due to the lack of consistent data collection and reporting across Texas’ 254 counties. As of 2016, there were 12,508 women incarcerated in TDCJ, or approximately 9% of the total incarcerated population. This is only slightly less than the total number of women in both state and federal prisons across the country in 1980. This emphasizes just how significantly women’s needs are failing to be met in the community. 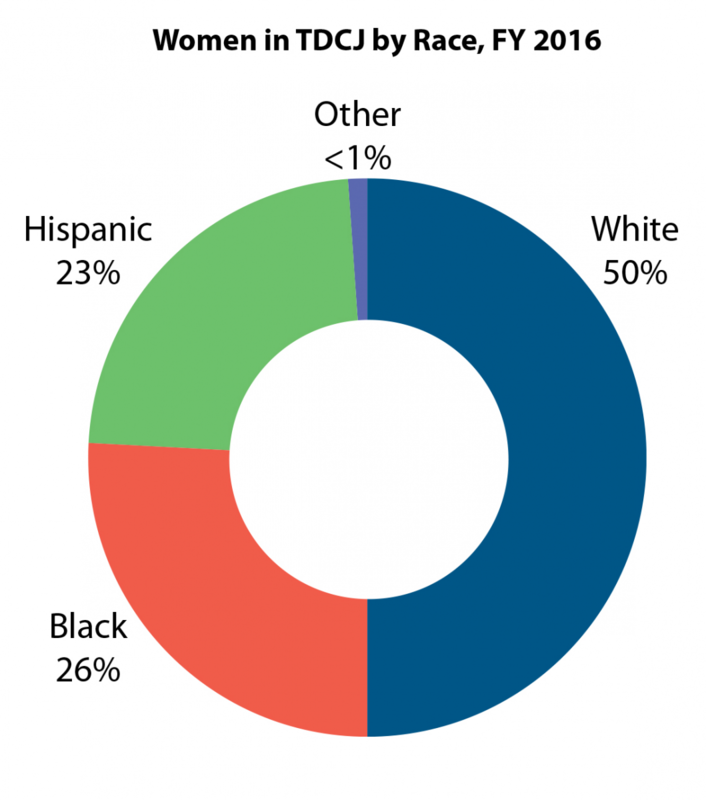 Per the chart below, half of women in TDCJ are white. 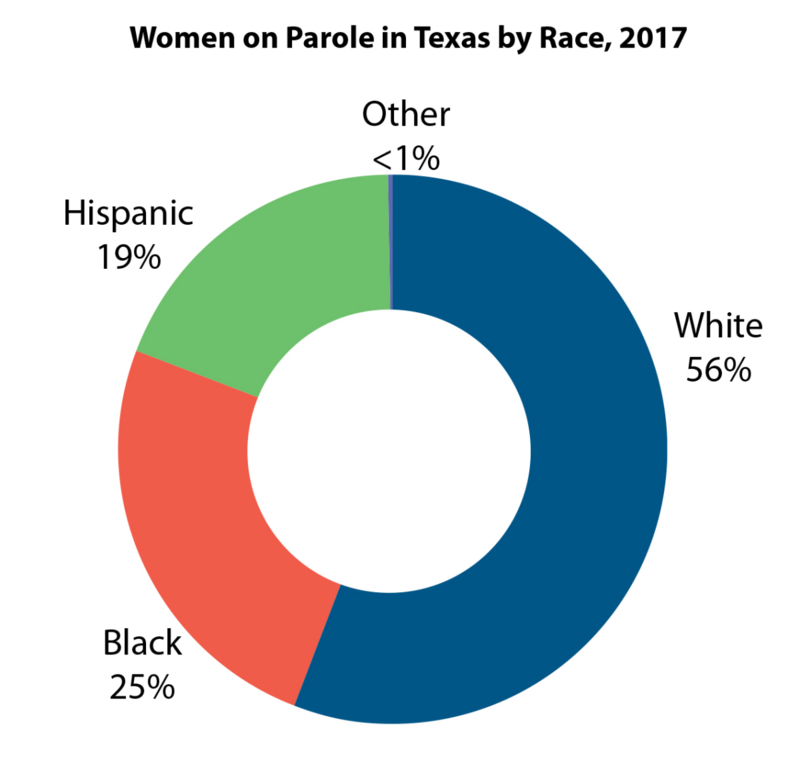 It should be noted that while Black individuals make up only 12% of the overall Texas population, Black women comprise 26% of the incarcerated female population. Women incarcerated in TDCJ are largely between the ages of 20 and 49. 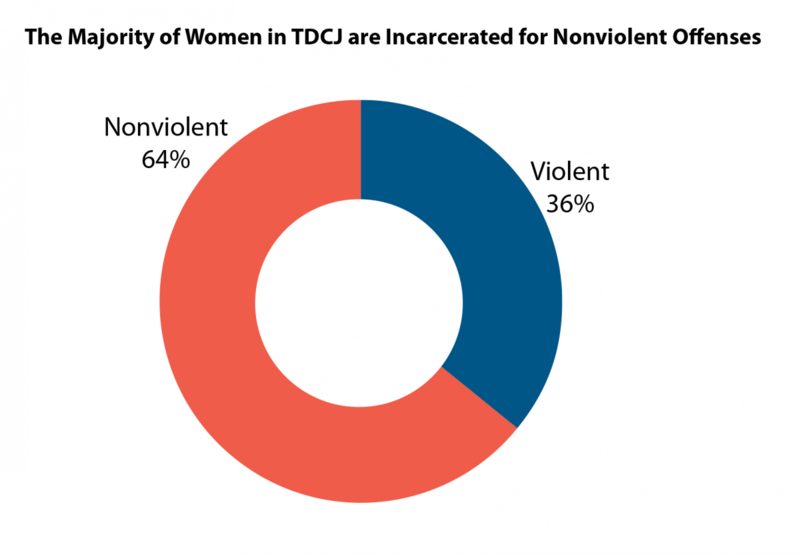 Women in TDCJ for nonviolent offenses far outpace men, with 64% of women compared to 42% of men incarcerated for a nonviolent offense. The majority of those offenses are drug possession or delivery. And regarding property offenses, 22% of women incarcerated in TDCJ are there for a property offense, compared to 14% of men. The average sentence length for a woman incarcerated in a TDCJ prison is 9.6 years. For women whose offense of record is a property offense, the average length of sentence is 8.1 years, compared to 9 years for a drug offense and 4 years for a prostitution offense. Women in TDCJ also outpace their male counterparts when it comes to substance abuse disorders, with 70% of women identified as suffering from a substance abuse disorder vs. 58% of men. Unfortunately, TDCJ does not track information relating to how many women have histories of trauma, such as sexual abuse and domestic violence. However, the Texas Criminal Justice Coalition’s survey of hundreds of incarcerated women revealed that more than half of all respondents had previously been sexually assaulted, while 82% had been victims of domestic violence. Women in TDCJ are far more likely than men to be parents, with a staggering 81% of women in TDCJ having children vs. 68% of men. While the basis for this report is to help women safely avoid incarceration, it is critical to ensure that women on parole have the tools they need to avoid re-offending and returning to confinement. As of June 2017, women on parole in Texas numbered 9,682, or 11% of the entire population of people on parole in Texas. Women spend an average of 2.8 years on parole. Per the chart below, the majority of women on parole are white. Female parolees under the age of 40 comprise 49% of the total female parole population. The most common offenses of record for women on parole are drug offenses, with 42% of women on parole for drug possession (24%) or drug delivery (18%). The majority of women on parole are on a regular (non-specialized) caseload. The most prevalent specialized caseloads for women are mental illness and substance abuse caseloads, with 14% of all female parolees on a mental illness caseload and 12% on a substance abuse caseload. Approximately 7,500 female parolees had a special condition for a substance abuse evaluation and related conditions of parole as of June 2017. Following that evaluation, treatment staff determine the appropriate level of substance abuse treatment required. As of June 2017, there were 3,283 women in an in-prison therapeutic community program or on a substance abuse caseload (44% of all parolees). TDCJ’s Parole Division does not have gender-specific caseloads. In FY 2016, the overall parole revocation rate was 7.2%. Of female parole revocations, 21% were for a “technical” violation. In other words, nearly a quarter of female parole violations were for failure to comply with the terms of parole, not for a new offense. Like with probation revocations among women, this lack of success under supervision points to the need for more effective assistance to help female parolees live stable, productive lives in the community. TDCJ does not track the number of parolees who have dependent children.